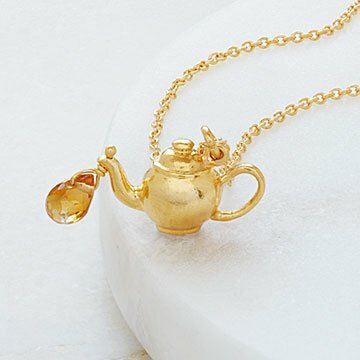 This whimsical teapot charm is a subtle tribute to your favorite warm drink. UK-based designer Alex Monroe is known for taking everyday objects and turning them into intricate, beautiful designs. And in the UK, what's more everyday than a cup of tea? Whether you fancy an herbal brew or are traditional black with the fixings, this whimsical teapot charm is a subtle tribute to your favorite warm drink. Each piece is handcrafted with magical details, like the citrine droplet, and makes its way from the world's tea loving capital into your unique jewelry assortment. Handmade in London.